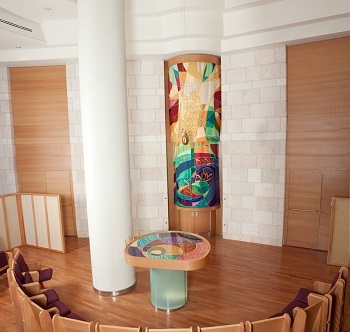 Artist as well as Life Member Sharon Binder, who immigrated to Israel in 1983, has designed an original parochet (ark curtain) and shulchan (table) cover for the torahs at the Moshe Saba Masri Synagogue in the Hadassah Medical Center’s Sarah Wetsman Davidson Hospital Tower. “We know that there are times when it takes more than medicine to heal,” says Binder. The parochet’s design expresses the notion of reaching heavenward in supplication and seeking guidance. Binder explains that she began by integrating three concepts: the Jewish tradition of healing, the symbolism and physical meaning of a heart, and the array of a human being’s emotions, illustrated through a full range of colors. 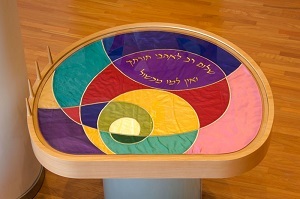 Binder , who majored in art and Jewish studies at Queens College (NY) and studied calligraphy in Canada, chose to use a quotation from the prophet, Jeremiah, from whom Hadassah also takes its motto, “The healing of the daughter of my people.” The quote reads: “Behold, I will bring her relief and healing. I will heal them and reveal unto them an abundance of peace and truth” (Jeremiah 33:6). When the ark is closed, the Hebrew words for peace and truth line up side by side. 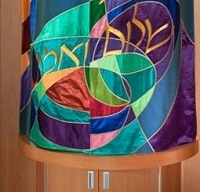 The shulchan cover, also resplendent in color, displays a saying from Tehillim (Book of Psalms), which conveys the message, “Those who love your Torah enjoy abundant peace, and there is no stumbling for them” (Tehillim 119:165). Mrs. Binder’s youngest son, Ben Zion, who photographed the designs, is a graduate of Hadassah Academic College Jerusalem.